Alanna Nash is the critically acclaimed author of biographies of Dolly Parton and Jessica Savitch. Alanna also authored: Elvis Aaron Presley: Revelations of the Memphis Mafia and collaborated with Alan Fortas on his book: My Friend Elvis. Alanna's new book, The Colonel: The Extraordinary Story of Colonel Tom Parker and Elvis Presley was recently published and has gained significant media and fan attention with its sensational new revelations about the Colonel and insights into his psychological make-up. Having now read The Colonel we can confirm that there is no doubt it lives up to its pre-publication publicity. EIN: Alanna, we really appreciate you taking time out of your busy schedule to talk to us today. AN: Nigel, it is an honor to be able to talk with you and to be on the EIN. Thank you for having me. EIN: I'll start with a few questions about your new book, The Colonel: The Extraordinary Story of Colonel Tom Parker and Elvis Presley. You really put some work into this project - meticulous research and writing over nearly six years and a finished book with 50 pages of acknowledgements and notes. Please tell us about your experiences in completing The Colonel. AN: Thank you for those compliments. This was an incredibly difficult project for many reasons. First, the Colonel had a certain power, even from the grave. There were people such as Eddy Arnold and Hank Snow who still wouldn’t talk much about him. Eddy refused to speak with me, and while he had given a few comments about the Colonel previously, some of which had been published and some not (these appear in my book, collected from various journalists and their transcripts), he always seemed almost afraid to talk about the Colonel, even to his own biographers. I asked him if he would simply relate positive anecdotes, then, even those that simply reflected his gratitude for the way the Colonel had directed his career. And he wrote me a letter saying no. That’s very strange. You’d think he’d want to preserve that part of history, if nothing else. I did end up with much more Hank Snow material than appears in the book, but I lost half of the first half of the book to editing. I had lots and lots more material about the Colonel’s involvement with country music stars between Eddy and Elvis. But my editor kept saying, “Get to Elvis.” So that material got short shrift in the final version of the manuscript. I hope to be able to use it elsewhere, or on my website, www.colonelparker.com . But the book was also difficult because it was so expensive to research. I am in deep debt because of that. Unless I get a film deal, I will never recoup it. Very few people make any money on books. You have to do it for the love of the project—or of solving the riddle, which is what I was trying to do. I wanted to know who this man really was, and why he made some of the decisions he did in managing Elvis Presley. A lot of them didn’t make sense on the surface. EIN: The principal issue being focused on by critics and readers is the possibility that the Colonel (aka Andreas Cornelis van Kuijk) fled his native Holland after brutally murdering a woman. You are very clear in The Colonel that there is no direct evidence linking him to the murder but you deftly present a case based on circumstantial evidence. Do you have a personal view on this particular incident? Whether you believe in that kind of stuff or not (and, of course, it’s all for entertainment and you can’t base research on it), it’s pretty fascinating. But here’s the bottom line to all of this. I cannot prove he did the deed, but I can prove he was capable of it. That army discharge paper is incontrovertible proof of that. “Constitutional psychopathic state” is 1933 language for what we now call Anti-Social Personality Disorder. Which is how we classify most murderers. EIN: The genesis for a case against the Colonel lies in the anonymous letter received by Dirk Vellenga in 1980. I find it interesting that despite having received the letter, and having knowledge of the murder, Vellenga did not include reference to it in his 1988 book (written with Mick Farren), Elvis and the Colonel. Are you able to shed any light on this? AN: Yes, I spoke with both Dirk and Mick, though more with Mick about the decision not to include it. The Colonel was still alive in ’88, and the publisher’s lawyers advised against reporting the murder theory or the anonymous note. Mick was so unconvinced as to the validity of it all that he was happy to oblige, even as he told me that true or false, his actual feeling was that Parker was quite happy to let a nebulous story about killing someone circulate just to give himself an edge, or a bit of mystique. But Mick recently also said, in a review of my book, that I was able to gather many more details about the murder and Parker’s possible involvement than what he and Dirk had. Now he says I all but nailed it. That’s very gracious of him, actually. He’s a wonderful guy. EIN: In The Colonel you cite several amazing offers made to the Colonel for Elvis to appear in concert outside the USA. The US$10m offer by Saudi billionaires, Adnan and Essam Khashoggi, for an Elvis concert at the Pyramids in Egypt is one we hadn't read of before and one that we can only dream about how good it might have been. How did you discover this offer? AN: Several of the Memphis Mafia were there when the offer came down and Elvis was so excited about the possibility of going. What a pity it is that that never happened. EIN: Following on from our last question, to what extent do you think Elvis should have taken more responsibility for his career options rather than allowing the Colonel to largely dictate what contracts were signed? AN: A lot more, obviously. But artists are not usually assertive and confrontational people, and the Colonel counted on this. Parker also counted on Vernon going along with him, and he usually did. Until I did this book, however, I hadn’t grasped what a force field Parker was. There was no bucking this man, unless, of course, Vernon and Elvis had simply paid him an exorbitant amount of money to leave. Even then, I imagine he would have found a way to stick around. There was something pathologically predatory about him. EIN: Alanna, were there any things you learned when researching The Colonel that you didn't include in the finished book. And if yes, can you give us any insights into what they are about? EIN: Alanna, you met the Colonel on a number of occasions. What were your impressions of him as a person? EIN: The Colonel seems to have had an almost Jekyll and Hyde personality. What positives and negatives did you perceive in his character? AN: That’s right. Kindness and cruelty, intimacy and secretiveness, generosity and stinginess. You’d see all of these things in a matter of moments. He was quite a study. EIN: And the Colonel's relationships with his two wives. How would you characterise those? AN: Well, I can only tell you my impressions. I believe he was really devoted to his first wife in many, many ways. But I am mystified as to why he didn’t get the care for her brain tumor that he should have. He accepted the word of a team of doctors who weren’t qualified to treat her condition that she was beyond help, that she was suffering from age-related dementia. In fact, if she had had a brain scan and been treated early on, she probably could have recovered. As it was, he kept her at home, away from the kind of care she needed. She was a prisoner inside her house and her body for nearly 20 years until she died. Why he didn’t take her to some place like Mayo’s really perplexes me. As for his second wife, Loanne, I would not want to speculate on that relationship other than what appears in the book. I will say that she took extraordinary care of him, and was his protector in many ways. It was obvious to me that she cared a great deal about him, and still does. EIN: Why do you think the Colonel refused to acknowledge his Dutch heritage and his family, even after they made contact with him? AN: I think there was something in his past that was too painful for him to admit, perhaps even to himself. He was capable of compartmentalizing his feelings, and he tried to put his emotions about his Dutch family in the most remote drawer of his mind. EIN: Do you think the Colonel was 'good' or 'bad' for Elvis' career? AN: He was the promoter of promoters, but not such a great manager, in that his own needs always superceded those of his client. However, you have to admit that he always found a way to keep his star on top, in one way or another. EIN: Alanna, on a related issue, the Colonel's massive gambling debt in Las Vegas. How significant do you think this was in decisions about the contracts that Elvis would sign? AN: Paramount. He used Elvis as a kind of human shield, especially in Vegas. EIN: Please tell us about some of the photographs you managed to secure for inclusion in The Colonel. AN: Few people outside of publishing realize that an author has to buy all the pictures for the inside of the book. (The publisher pays for the cover.) I spent roughly $6,000 for pictures. Actually more than that, because I bought pictures that I ended up not being able to use for space considerations. I’m proud of what I found, because there are a lot of pictures in there you don’t normally see. However, I desperately wanted a really fetching picture I had seen of him with the young Tommy Sands, and could never get my hands on it. Tommy didn’t even have it. Nor did Graceland, in the Colonel’s private collection. Ironically, the “National Enquirer” had published it, but if they still had it, it was locked up in their anthrax-ed building, and no one is allowed to go in there. Oh yes, I also really wanted a picture of him with Minnie Pearl, and I found it only after my deadline had passed. It appears in my “Country Music” magazine story about the Colonel’s Grand Ole Opry connections. You can read that on my website. EIN: What has surprised you the most as you've researched Elvis over so many years and talked to those who knew him? AN: The dichotomy of the greatness of his talent (which just seemed innate) and the emptiness of his private life. EIN: Elvis Aaron Presley: Revelations of the Memphis Mafia gave fans a new insight into Elvis the man and Elvis the performer. One of the issues discussed was "Elvis the supercop". Why do you think Elvis had such a fascination with law enforcement? AN: I think it goes back to his father’s stint in prison. Also to the fact that he couldn’t “police” his own life. How’s that for psycho-babble? Actually, I think there’s a lot of truth in that. EIN: Few fans will be aware that during the mid 1970s undercover FBI agents traveled as part of Elvis' entourage. What can you tell us about situation? AN: I don’t think I can add to that in any significant way, actually. EIN: Alanna, after writing three books about Elvis you must have formed a view on who Elvis Presley was. How would you sum up his personality or character? AN: That’s too great a task in a small space, at least for me. I will say he was a deep and true artist who emerged almost full-blown on his first recordings. It’s as if he had been dropped in here from another planet, and that he simply got lost trying to find his way home. EIN: In Revelations of the Memphis Mafia, Billy Smith commented that "But at times, I wonder if he (Elvis) loved any body." Elvis' ability to love - what is your view on his emotional capability? EIN: What do you think killed Elvis Presley? Creative apathy or a combination of personal-psychological factors? AN: A combination of personal and professional disappointments coupled with reckless behavior and an inherited tendency toward addiction. I think he could not stand what he had become, and numbed the pain out whenever possible. As Mike Crowley says in the book, “Nobody killed Elvis except Elvis.” But you have to wonder why the Colonel did almost nothing to stop him. EIN: EIN recently published an interview around the enduring Elvis Is Alive phenomenon. Do you have a view on this sub-culture in the Elvis world? AN: Only that some people want him back so desperately that they will do anything to keep that hope alive. EIN: Alanna, the first book of yours I ever bought was the biography Dolly (Parton). Dolly is known to be a big Elvis fan. Did you and Dolly ever discuss Elvis? AN: Thank you for buying that book. It came out first in 1978, and is available again with an updated final chapter. (“Dolly: The Biography.”) Alas, I never did ask her about Elvis, but I do know that he wanted to record one of her songs (variously reported as either “Coat of Many Colors” or “I Will Always Love You,” though I’ve heard her reference the latter) and she wouldn’t give up part of the publishing, as Parker requested. She said she cried all night over the decision, particularly as she could have used the money at the time. EIN: Dolly Parton, the person. What is she like? AN: She’s like Elvis…at times you think she must have been dropped in here from some super-evolved nova. There’s something otherworldly about her, and about her talent. Something mystical, almost. Of course, that’s combined with that very human charm and sense of humor and her extraordinary looks. She’s irresistible. EIN: Can we talk about Alanna Nash. Who is Alanna Nash and what does she do in her spare time? AN: She’s just a ordinary journalist beguiled by an extraordinary story, that’s all. Spare time? What’s that? EIN: Where do you call home? EIN: How did you get involved in writing/journalism? AN: I was a trained musician as a child, and I combined my love of music with my love of words. If I’d had any real talent, I would have been a musician. But I didn’t have, and I was embarrassed by performing. I was more comfortable behind the scenes. EIN: Which of your books has given you the most satisfaction and why? AN: Well, I have to say this one, in that it seemed an “ungettable” story. Some people say I still haven’t gotten it, but I think I’ve gotten as close as anyone is going to get. And I did so only because so many people were willing to help me, starting with the Colonel’s family in Holland. They wanted to solve the riddle as much as I did. We became a team, of sorts. Marie Parker’s daughter-in-law, Sandra Polk Ross, in Florida, also was incredibly supportive and helpful. She has become a true friend. And Byron Raphael was a great, untapped source for the Colonel’s early years in Hollywood. He also served as one of the Colonel’s confidantes, to some degree, and he was eager that I understand both sides of the Colonel’s nature. EIN: Do you have any plans for writing a fourth book about Elvis? AN: No. I think there isn’t enough new to say. And this book was really more about Parker than Elvis. I would like to explore his early years a bit more. My hope is that people who haven’t talked before, such as Andy Griffith, will come forward and share their stories for the historical record. EIN: Who or what will your next book be about? AN: I have so much debt on this one yet that I can’t think about delving into a new project, other than magazine work! EIN: You are busy promoting The Colonel over the coming months. Where can fans get to meet you? AN: My website, www.colonelparker.com , will list those events. I may be going to England in the fall as the English edition appears. We have to work that out yet, though, so it’s really premature for me to even say that. EIN: Alanna, it has been a great pleasure talking to you today. Once again our sincere thanks for making time available to us and we wish you continued success in the future. AN: Nigel, thank you for asking such probing questions. You always write so intelligently about this topic. 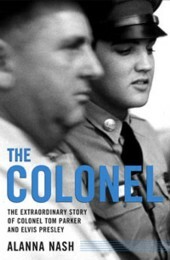 Read EIN's review of The Colonel: The Extraordinary Story of Colonel Tom Parker and Elvis Presley My Friend Elvis, also released as Elvis, from Memphis to Hollywood: Memories from My Eleven Years with Elvis Presley, and Elvis Aaron Presley: Revelations of the Memphis Mafia are currently out of print.